I had never even thought of getting a pressure washer. Can’t a hose and/or bucket do the job just as well? So I was even slightly alarmed when Karcher approached me to review some of their products as part of their Super Blogger programme. 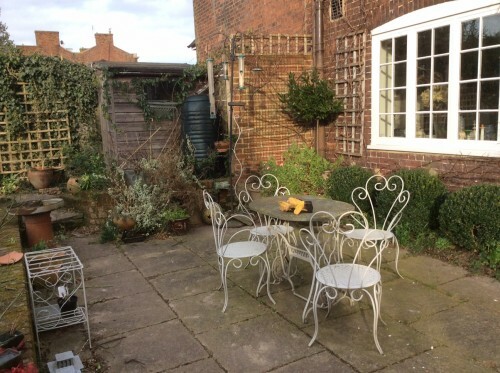 But our terrace had started to look grubby and cluttered, and I thought that reviewing the Karcher K4 pressure washer would give me the impetus to get it sorted. The K4 arrived in its smart yellow livery, and I got Mr Middle-size to help me with unpacking it and reading the instructions. He doesn’t enjoy gardening, but nor does he trust me with any sort of machinery. He pronounced the K4 as ‘good solid German engineering.’ His degree is in engineering, so this is a compliment. He checked which parts went where (it all fitted together very simply, but I always prefer someone else to do it for the first time, then show me.) Meanwhile I read a pictorial leaflet showing drawings of people cleaning things around their home and garden with the K4. I had always assumed that pressure washers were for cars and driveways, and, by extension, terraces. 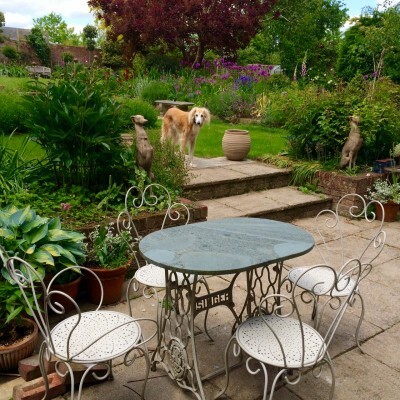 These cartoon characters were cleaning their garden furniture, their windows, their parasols, wheelbarrows, swimming pool, steps, paths, benches… Some were using special attachments – a full blast power jet can’t be directed at every surface – but otherwise a whole new world of sparkling cleanliness beckoned. 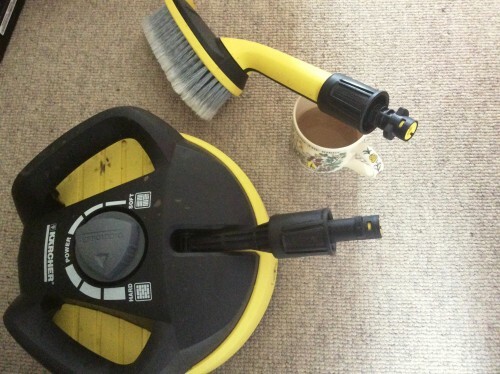 First you have to sweep the terrace thoroughly, then Mr Middle-size put the K4 through its paces before allowing me anywhere near it…although it’s a fairly straightforward ‘plug it in, click in the bottle of detergent at the back and switch on’ technology. 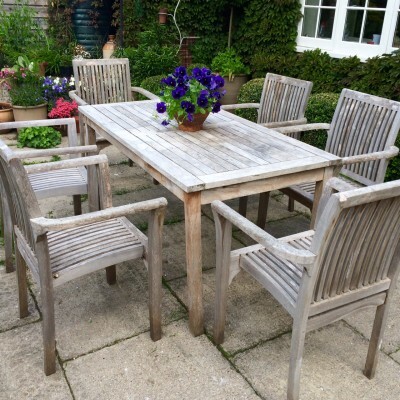 We had two tables to clean – one teak and one granite. We always wiped or scrubbed them before we ate on them, but there had been a build up of lichen – and during the winter they hadn’t been cleaned at all. Using a new piece of equipment for the first time is always time-consuming – reading the instructions, setting it up etcetera…but once we actually started cleaning, it really was very much faster than using hoses, buckets and scrubbing brushes – and much cleaner, too. It was also so easy that Mr M decided to leave me in charge and get back to his emails. The instructions warned us to beware of ‘recoil’ immediately after switching it on. However, I’m not particularly strong and had no problems at all with recoil when I switched on. I then got so fascinated by watching how the lichen and general dirt was being stripped off the terrace paving stones in seconds that I completely forgot to take any notice of where the water was spraying after that. I soaked myself, the windows, the garden gate and even…I shudder to admit this…the extension plug. Very dangerous. 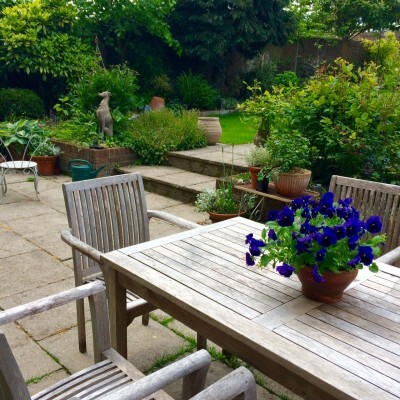 We re-arranged the furniture once the terrace and furniture had dried out (just a couple of hours in decent weather). We’re really pleased with the result. Mr M came down to find it looking like the scene from ‘Paddington’, where Paddington Bear uses the ‘facilities’ for the first time. Muttering that he should never have left me alone with a piece of machinery, he showed me how to reduce the pressure so that I could use the K4 to spray the mud I’d spattered everywhere quickly off the windows and doors. The extension plug was then whisked inside for safety and I had a shower. I will be using the K4 more sensibly next time. The other side of the terrace…Benji is a bit surprised at so much cleanliness..
Our daughter was surprised to see that we had a pressure washer. 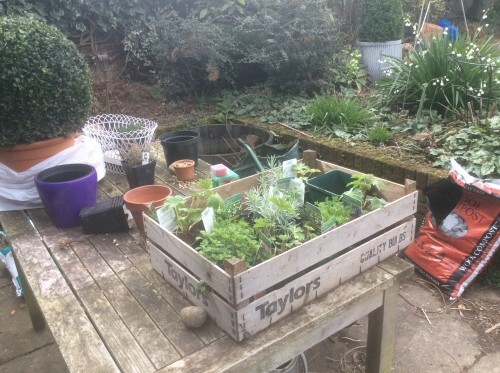 She has a degree in environmental sciences and works in what could broadly be called ‘the green sector’, so immediately asked whether it used more water than a hose. However Karcher say that it actually uses less water than an ordinary garden hose doing the same job – presumably because it does the job so much faster. There are also ‘ecological models’, which save 20% on water and energy consumption. 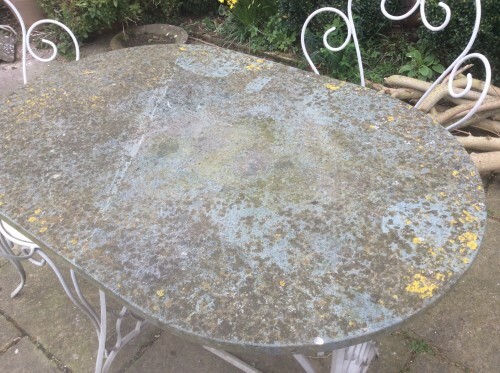 Another view of table and terrace after being Karcher-ed. This photograph was taken two months after the clean-up, so I think that we would only need to use the K4 once or twice a year to keep the terrace looking good. 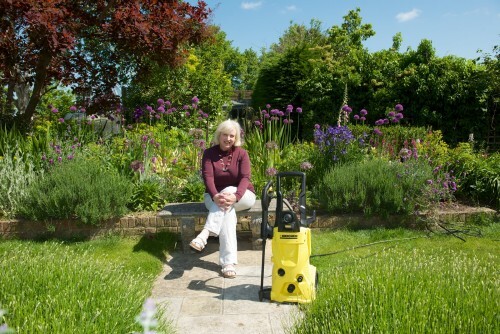 I’m won over to pressure washers now – easy to use, quick and effective. 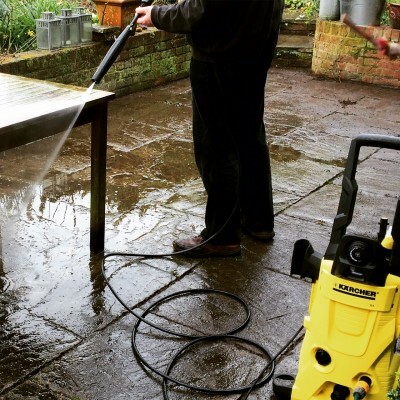 I’ve had a number of requests from friends wanting to borrow my K4 to Karcher their own terraces – I almost feel a slight reluctance to let it out of my sight.